Take a look at most commercial skin care ingredient lists and you have to pull out a dictionary to figure out what’s in it. After I discovered the Cosmetic Safety Database, it really began to hit me just how dangerous commercial brands might be. I mean, I sure don’t want to slather my face with a lotion that has ingredients linked to cancer, or put on a deodorant that contains chemicals known to negatively impact the nervous system. For me, it’s worth it to buy organic skincare products. I don’t have to worry about what’s in there, and my skin is healthier because I’m not blasting it with chemicals and artificial fragrance. All of this is why I’m in love with the Miessence Organic Skin Care line. You might not have any idea who this company is. After all, you can’t buy it in stores, even small health food stores. All Miessence organic products are sold by independent reps. The company is actually really cool. They claim that their products are so natural you can eat them. I wouldn’t try it myself, but I don’t doubt their claims. Everything on the back label is stuff I can pronounce. This is good. And all their ingredients are certified organic. Miessence is also a carbon-neutral company. They purchase Renewable Energy Credits from Native Energy to offset their transportation and home energy use. I definitely give them kudos for that! The coolest thing about Miessence Organics is that they’re a signer of The Compact for Safe Cosmetics. The Campaign for Safe Cosmetics is a coalition of women’s, public health, labor, environmental health and consumer-rights groups. Our goal is to protect the health of consumers and workers by requiring the health and beauty industry to phase out the use of chemicals linked to cancer, birth defects and other health problems, and replace them with safer alternatives. Personal care products like shampoo, conditioner, after shave, lotion and makeup are not regulated by the FDA or any other government agency. It is perfectly legal and very common for companies to use ingredients that are known or suspected to be carcinogens, mutagens or reproductive toxins in the their products. Consumers buy these products at drug stores, grocery stores, online or in salons, usually without questioning the product’s safety. Huge, huge perk in my book for signing this commitment for safe cosmetics. Not many companies have the integrity to make a stand like that. I tried three products from the Miessence Organic Skincare Line: the Balancing Cleanser, the Balancing Skin Conditioner, and the Balancing Moisturizer. I also tried the Organic Lemon Toothpaste. The Miessence Organic skincare line is awesome. The #1 ingredient in all three is aloe, and other ingredients include sunflower oil, marshmallow, ylang ylang oil, olive juice extract, and lavender. There is nothing on the ingredient list that I couldn’t pronounce. Fabulous. The scent of the cleanser is really nice. This is the one with the ylang ylang oil in it, and it’s kind of a musky, mysterious scent that’s paired with an undertone of citrus. After using these products for a few weeks I noticed a few things about my skin. It looked brighter and healthier. My face didn’t feel sticky after washing. It just felt clean. So, it’s safe to say I love this line. And the very best part? It scores a ZERO from the Cosmetic Safety Database. This means that these products are incredibly safe and pure. This is the only product I have that’s been able to score a zero. The only downside to this line is that it’s a bit pricey. But, you don’t need to use a lot when you wash your face. I use a very tiny dot of cleanser, and two tiny dots of the moisturizer. A little goes a long way with this stuff, so these bottles should last you a good long time if you make the investment. 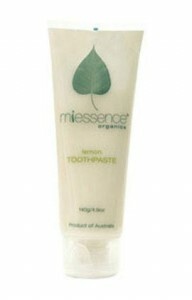 I had mixed feelings about the Miessence Organic Lemon toothpaste, and it’s because of the flavor. The toothpaste was heavy on the baking soda flavor, which I’ve never been able to stomach well. I’d been using Tom’s, which does not have a baking soda flavor, so the switch was a bit of a shock. But, it frothed well, and I definitely felt my teeth were clean after using it. The lemon was refreshing to be sure, but it wasn’t strong enough to cover up the baking soda taste. So, if you have no problem with baking soda (and many people don’t) then you’ll probably love this toothpaste. I’m wholeheartedly impressed with this company. I mean, I was literally floored when I found out that the Organic Skincare pulled off a zero at the CSD. I’d been using Kiss My Face Olive and Honey soap, and not even they scored a zero (they scored a three). So, this was super cool to me. But it’s not just that. It’s the fact that this organic skincare line is really high-quality. I mean, my skin really looks and feels fabulous after using these soaps and moisturizers. So yes. There is a warm feeling in my heart for these products. If you want to check out the Miessence Organic Skincare line, you can head over here. They’re definitely worth a looky-loo! This is a really timely post for me. I’ve been researching the Miessence skin care line and was impressed with what I saw (a rating of 0 for heaven’s sake!). BUT, I didn’t know of anyone who’d actually tried the products, so I’ve been on the fence. Great to know the products are safe and really do work. I know! I almost fell over when I looked them up. I mean, no one scores a zero! But they did. It was amazing. Glad this post helped you out! I also love their products! I get great satisfaction knowing that I’m not exposing myself, or my family, to unnecessary chemicals. I’m willing to pay more for these exemplary products. The deoderant alone is phenomenal – without aluminum! However, I just want to make a correction: these products can be found at small health food stores. One Group is one company that does allow it. 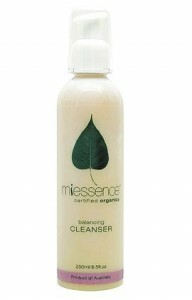 Miessence is my favorite brand of organic skin care products. They are a lot more expensive than other natural or organic products but in my opinion, it’s worth it because the ingredients are certified organic and they work great.